Dedicated to document management, NewSoft provides the Presto! PageManager Software Development Kit and customized services to the customer, letting them enjoy the powerful functions like document management, OCR recognition, PDF splitting, merging, stacking, and annotating. Presto! PageManager customized services can be combined with scanners, printers, MFPs (Multi-Functional Peripherals), and digital cameras to organize documents and images. Presto! PageManager Software Development Kit lets the developer quickly integrate and add new features to Presto! PageManager to use it in the enterprise customer's systems. Integrated with hardware like MFP, handheld scanners, scanners, printers, and digital cameras and combined with scanning and photography, Presto! PageManager provides valuable functions to help customers improve product quality. It is an ideal solution for document management and a great choice for the enterprise customer. Presto! PageManager Software Development Kit lets the developer quickly integrate and add new functions to Presto! PageManager. It is suitable for the Windows platform, and the developer can use this package to customize and add new components to expand the Presto! PageManager application. The Presto! PageManager Software Development Kit offers faxing, e-mail, OCR, printing, personal data and document management system functions. The developer can add new applications and function keys, such as browsing specific webpages or opening specific applications. Cooperation with the start and end of the application: the developer can synchronize with the start or end command for specific functionality. For example, it can start a specific function when activating the software, or stop a specific function when shutting down the software. ♦ Provide API (Application Program Interface) for OCR, file format conversion, and file searching to allow the developer to quickly integrate these functionalities to the enterprise's systems. If you have any customization requirements for the Presto! PageManager Software Development Kit, please contact us. Samples for usage of the Presto! 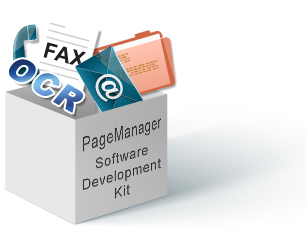 PageManager Software Development Kit are as follows. NewSoft can develop exclusive document software packages for the enterprise customer and the developer according to their needs. Presto! PageManager offers document management, personal data management, OCR recognition, various file format conversion, file searching, faxing, e-mail, text recognizing, and printing for a suite of software used in MFP. It is an ideal choice to integrate software with hardware. Presto! PageManager is a great partner for the enterprise customer with image input requirements and digital office equipment. Combined with handheld, special sized, and A4 size scanners, Presto! PageManager provides all-directional document management solutions for customers with image input requirements. The enterprise customer can organize important files with collaborative software like Microsoft SharePoint or ERP (Enterprise Resource Planning) software. If combined with the Presto! PageManager Software Development Kit, sharing files will become much easier. Since the arrival of the mobile age, the enterprise customer often needs to store or share data and information between cloud disks and social media networks. The developer can integrate the Presto! PageManager Software Development Kit with cloud disk platforms, like Dropbox, Google Drive, SkyDrive, Box, SugarSync, Evernote, or Facebook to manage important enterprise files.